With only the odd exception, stunts in the James Bond series have always been done 'for real', and it is that authenticity which keeps audiences on the edge of their seat and coming back for more every time a new adventure unfolds. 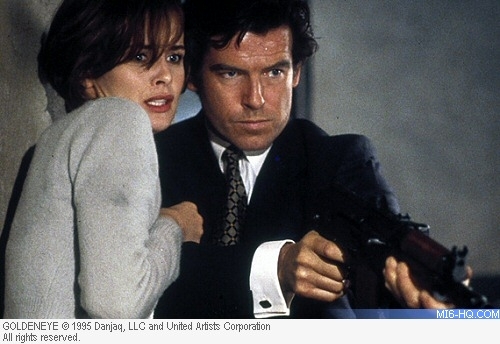 Stuntmen Steve Griffin, Marc Cass and Joss Gower recall some of the moments working on Pierce Brosnan's debut outing as 007 in the 1995 film "GoldenEye". I came onboard the production fairly early on in the preparation stages, so I got a say in what crashes we were going to do. 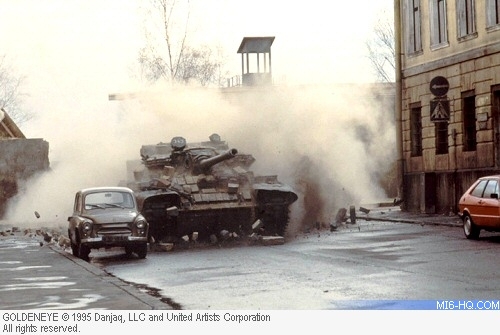 For the tank escape sequence; it was filmed partly in Russia, in St. Petersburg, and partly at Leavesdon in the studios, where we built our own street for the scene. I think from start to finish it probably took 6 weeks to shoot. Rather than retrofit Ourumov's car, we just changed the handling for the vehicle. A Volga was like the Russian version of a limo, its not much of a sporty car so we raised the suspension and lowered it slightly. We put lower profile tires on it, hydraulic handbrake, etc. It handled a bit better. We used specialist engineers and we made small modifications as we filmed. Although the action followed the storyboards quite closely, we received them quite late. Prior, we only had a rough idea of what we wanted to do. We rehearsed certain scenes to see what was good and what was bad and we just went with the good stuff. Including the police cars and the ones we crashed, we probably went through 50 vehicles. There was one big stunt that I did on Goldeneye which was horrible. I was doing an air ram and I had a fire suit on and I was covered in pads. I also had 3 bombs on me. Three massive bombs on me! We call them the tomato bombs as they looked like giant tomatoes. They were attached to me and were going to explode as I hit off an air ram. I also had a wire attached to me as well. The idea was that an explosion went off behind me triggering my air ram to through me forward. As I was in the air another explosion was coming from my right hand side and I would then be pulled to my left hand side on the wire… through a window……if that all makes sense! Only Simon Crane could of thought of that one! It was horrible because the whole very expensive set blew up and it did not really go to plan. I ended up getting pulled back onto my own air ram lying face down on it... and it re-fired. Ouch! The beginning part of the shot was used in the final film. We have have to keep trying new stunts to make action films more exciting. On this occasion, Simon only got half the result. It was quite early in my career and it was a really testing moment. I think I came through it OK because I didn’t stop working for Simon Crane for a long time after that and he wouldn't not have picked me in the first place if he didn’t think I was the right person for the job. 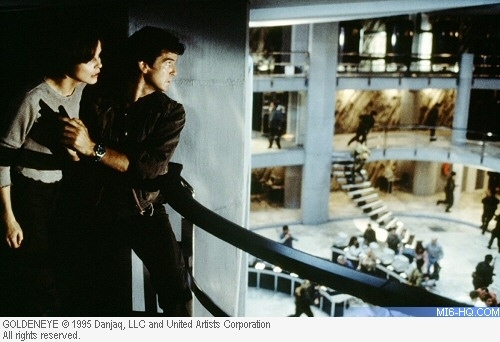 GoldenEye has to be one of my favourite Bond films of recent years. I was involved in the GoldenEye facility in Cuba that blows up. There were about 30 stuntmen involved in the sequence where the fuel tanks explode. I remember it being really, really hot. You see me in the shot when it blows up; I was the guy at a desk sort in the foreground. I was playing an operator who is shocked at what has just happened - he stumbles over the desk and ends up crawling out of the room while all the other guys are ducking and diving out of the way of the fire. As part of the effects for that sequence, my colleague Nick Gillard was to be blasted with a large flamethrower which was meant to be an explosion. We were escaping up a fire escape and Nick was below us in a full body burn. I remember that I wished I had been doing NIck's job that day, because he had the suit to protect him. The heat was coming up off Nick' full body burn and hitting us through the air hole we were climbing up. I was pretty glad to get out of that. I also had to be seen kicking a few stuntmen who were on fire on the floor, to make a route through them. I’m sure that was amongst lots of the shots that hit the cutting room floor. All of those fire sequences too many weeks to complete. 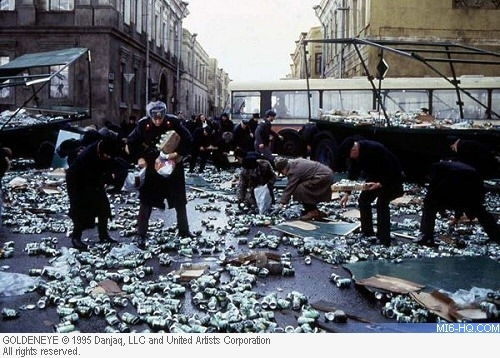 I was also involved in the tank sequence when Bond comes down the street and everyone is running out of the way as he smashes through the Perrier articulated truck and the cans fly everywhere. I played a Russia policeman shoeing away what are meant to be members of public to stop them stealing the cans of water, but instead we’re putting them into the back of our police cars. Another little moment that took a while to film but didn't make the cut.